Sometimes Foodie: Ice Cream for Breakfast! Rounding out the faux-ice cream trifecta is this box of limited edition Cocoa Puffs Ice Cream Scoops. I found these at Ollie's Discount (which is where all limited edition food goes to die), and even though I am pretty sure these are going to taste gross, I couldn't pass up having a third Neapolitan review on the blog. and now, we have faux-ice cream for breakfast! Packaging-wise, this is way better than m&m's take on the subject. 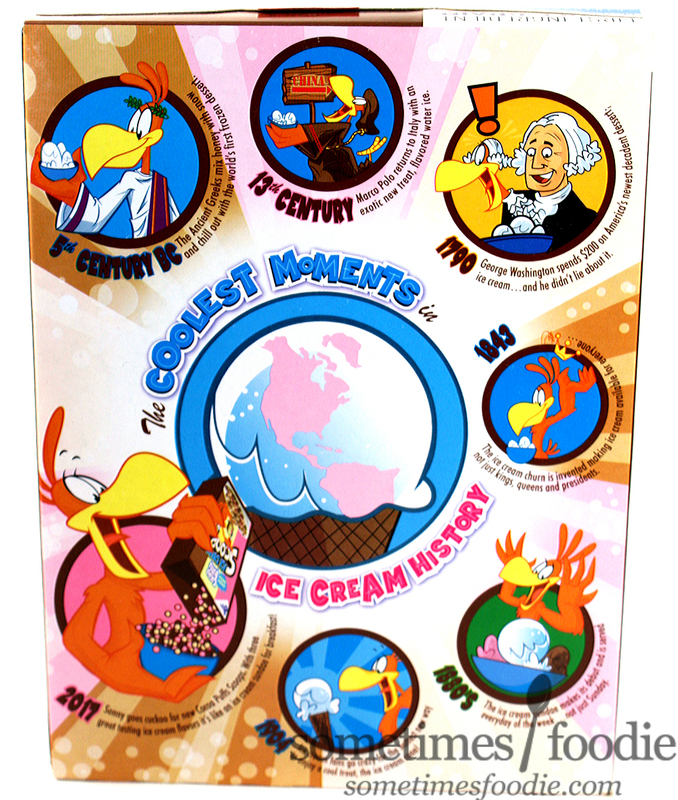 We have bright stripes of Neapolitan colors, mimicking the layout of a real ice cream carton, Sonny serving up scoops in a stylized paper hat, and a bright blue contrast that makes the text POP. Of the three, this is easily the most appealing, and fun, design. 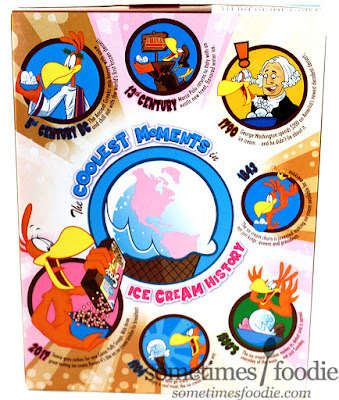 On the back, we have a very brief history behind frozen desserts. Although I'm not 100% sure all these facts are entirely accurate, it's entertaining, visually interesting, and mildly educational. Sleepy me appreciates the bright colors and mild stimulation in the morning. Once opened, the bag inside smells...good? Honestly, this stuff smells WAY better than I ever expected. The aroma reminds me a lot of Berry Kix, one of my favorite cereals growing up. I can smell lightly sweetened cereal and some fruity notes, but, surprisingly, I don't smell any chocolate. 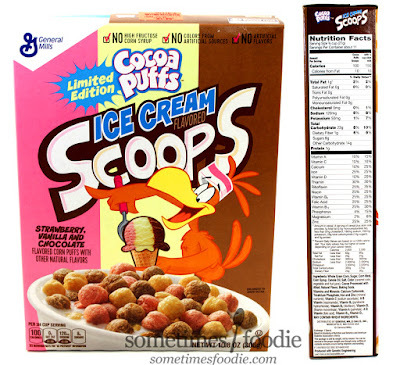 Chocolate-less Cocoa-Puffs? How can this be? 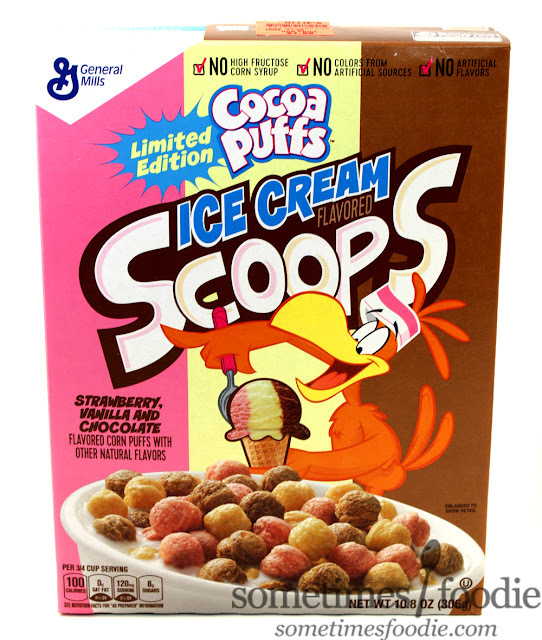 These "scoops" are pretty small, way smaller than I expected. 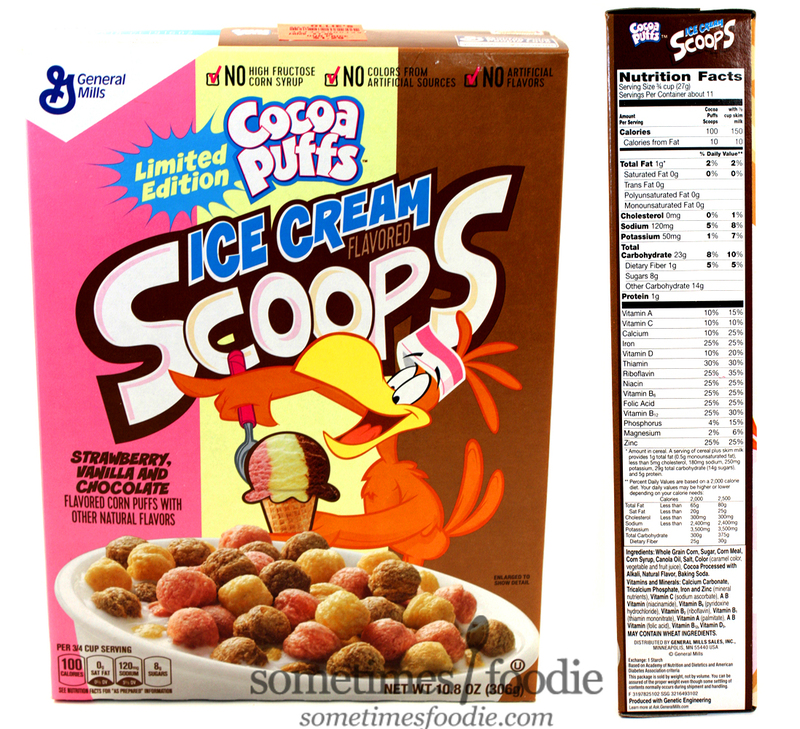 I thought we'd be getting normal Cocoa Puff-sized cereal in different ice-cream colors, but this is very different from your average Cocoa Puff. All of the puffs are significantly smaller and pellet-shaped. It kind of looks like a multicolored dry dog food of some kind, and everything is very muted. Not so appealing, but the box does state that no colors from artificial sources are used, so that's to be expected. I grabbed a bowl, added some milk, and took a bite. Does it taste like ice cream? Not at all, but it IS GOOD. Just like are aroma indicated, this has a light, sweet, fruity cereal flavoring that throws me right back to Saturday mornings eating Kix cereal with my cousins while watching cartoons at their house. 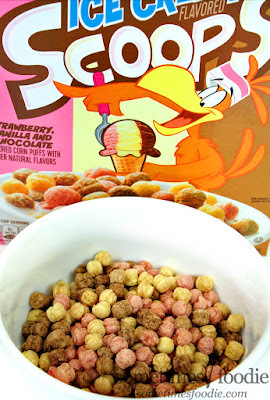 (Because they had Berry Kix and we never did.) The lack of chocolatey flavor is surprising, but I honestly don't miss it. I think if the chocolate notes were bolder the cereal would be less enjoyable. 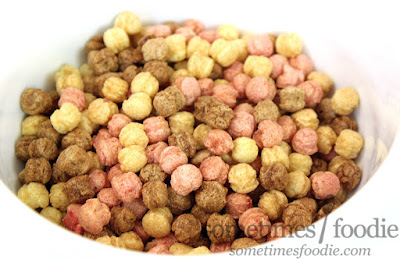 Just as an experiment, I tried a few of each colored piece of cereal on it's own, to see if the brown tasted different from the pink and so on. The results were...I don't think so? When I covered my eyes and ate indiscriminately, I couldn't tell a difference between any of the colors, but when my eyes were open, I swore the pink colors had a bolder fruity flavor. Deep down, I believe that all of these colors have the same sweet and fruity flavoring, which tastes absolutely nothing like ice cream, but it does make for an enjoyable, slightly tangy, fruity cereal. I really thought these were going to be gross, but they weren't! 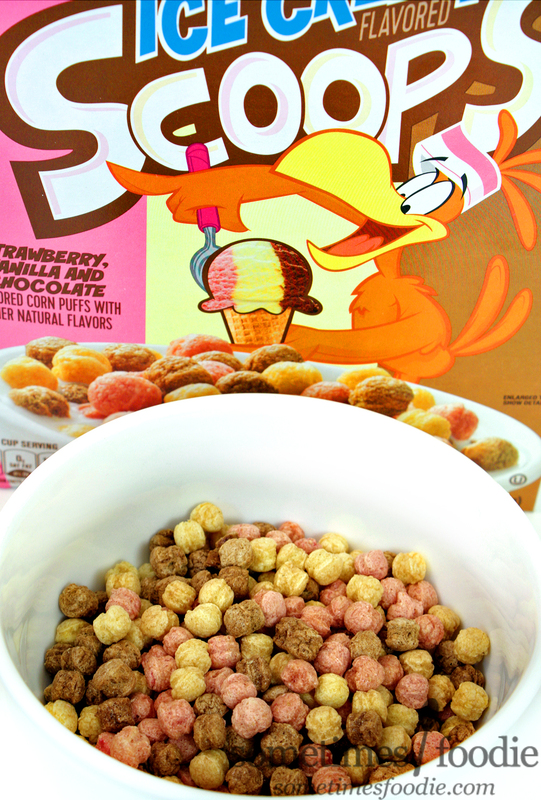 My family seems a little turned off my the idea of ice cream flavored cereal, and none of them have bothered to touch the box when reaching for their morning bowl, but I don't mind. That just means there's more for me to munch on when re-watching Jem and the Holograms.